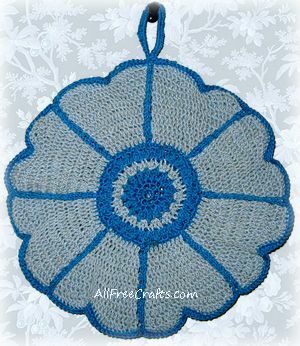 This daisy potholder was my first attempt to recreate a vintage pattern from Star Potholders, Book 55 which was first published by the American Thread Company in 1947. My first observation is that this pattern takes a lot more time to complete than you think – but that’s partly because I didn’t realize until I began crocheting that it consists of two sections, almost identical except for the center. The thread that I used came from the thrift store, but I believe the royal blue (the darker color, used as the contrast color), was a Size 10 cotton crochet thread. The paler blue was thinner, but not as thin as a Size 30, so I’m guessing it was a size 20 crochet cotton thread. Gauge on this potholder isn’t critically important, but fine thread will make a smaller potholder than a larger thread. Using a 1.5mm steel needle, and the yarns mentioned, mine finished up at seven inches in diameter. American Thread Company “PURITAN” MERCERIZED CROCHET AND KNITTING COTTON, Article 40. 1 – 250 yd. Ball White and “STAR” PEARL COTTON, Article 9, Size 5. 2 – 50 yd. Balls Yellow or any Color desired will make 2 potholders. FRONT SECTION: With Yellow, ch. 6, join to form a ring, ch 1 and work sc in ring, join. 2nd Row – 2 sc in each sc. 3rd Row – Ch 3, 3 dc in same space, slip loop off hook, insert in 3rd st of ch and pull loop through, ch 2, * 4 dc in next st, drop loop off hook, insert in 1st dc, pull loop through, ch 1 to tighten st, (popcorn st) ch 1, repeat from * all around, join, (16 popcorn sts) sl st between popcorn sts, drop Yellow. (When changing Color always complete last half of st with next Color. )4th Row – Attach White, ch 3, 2 dc in same space, * 3 dc between next 2 popcorn sts, repeat from * all around, join in 3rd st of ch. 5th Row – With Yellow, ch 3, popcorn st in next dc, * dc in next dc, popcorn st in next dc, repeat from * all around, join in 3rd st of ch. 6th Row – Ch 1 and work 2 sc in each dc and 1 sc in each popcorn st (72 sc), break Yellow. 7th Row – With White, ch 3, 1 dc in each of the next 8 sts, * ch 2, 1 dc in each of the next 9 sts, repeat from * all around, ch 2, join. 8th Row – Ch 3, dc in same space, 1 dc in each of the next 7 dc, 2 dc in next dc, ch 2, 2 dc in next dc, 1 dc in each of the next 7 dc, 2 dc in next dc, repeat from * all around, ch 2, join. 9th Row – C. 3, (counts as 1 dc) 1 dc in same space, 1 dc in each of the next 2 dc, 2 dc in next dc, 1 dc in each of the next 3 dc, 2 dc in next dc, 1 dc in each of the next 2 dc, 2 dc in next dc, ch 2, repeat from beginning all around, join. 10th Row – Ch. 3 (counts as 1 dc) 1 dc in each of the next 2 dc, 2 dc in next dc, 1 dc in each of the next 7 dc, 2 dc in next dc 1 dc in each of the next 3 dc, ch 2, repeat from beginning all around, join. 11th Row – Ch 3 (counts as 1 dc) dc in same space, 1 dc in each of next 15 dc, 2 dc in next st, ch 2, repeat from beginning all around, join. 12th Row – Ch 3, (counts as 1 dc) dc in same space, 1 dc in each of the next 5 dc, 1 sdc in each of the next 2 dc, (sdc: thread over needle, insert in stitch, pull through, thread over and pull through all loops at one one time) 1 sc in each of the next 3 sts, 1 sdc in each of the next 2 sts, 1 dc in each of the next 5 sts, 2 dc in next st, ch 2, repeat from beginning all around, join. 13th Row – Ch 3, (counts as 1 dc) 1 dc in each of next 5 sts, 1 sdc in each of the next 3 sts, 1 sc in each of the next 3 sts, 1 sdc in each of the next 3 sts, 1 dc in each of next 6 sts, ch 2, repeat from beginning all around, join. 14th Row – Ch 3, 1 dc in each of next 2 dc, 2 dc in next dc, 1 dc in each of thenext 3 dc, 1 sdcin each of the next 2 sts, 1 sc in each of the next 3 sts, 1 sdc in each of the next 2 sts, 1 dc in each of the next 3 sts, 2 dc in next st, 1 dc in each of the next 3 sts, ch 2, repeat from beginning all around, join. 15th Row – Ch 1, 1 sc in same space, ** 1 sdc in each of the next 2 sts, * 1 dc in next st, repeat from * once, 1 dc in next st, 1 sdc in each of the next 2 sts, 1 sc in each of the next 3 sts, 1 sdc in each of the next 2 sts, * 1 dc in next st, 2 dc in next st, repeat from * once, 1 dc in next st, 1 sdc in each of the next 2 sts, 1 sc in next st, ch 1, sl st in next loop, ch 1, sc in next dc, repeat from ** all around, break thread. BACK SECTION: Work 1st 2 rows same as front section. 3rd Row -Ch. 4, dc in next sc, * ch 1, dc in next sc, repeat from * all around, ch 1, join in 3rd st of ch (16 dc) sl st into mesh, drop Yellow. 4th Row – Attach White, ch 3, 2 dc in same space, * 3 dc in next mesh, repeat from * all around, join, drop White. 5th Row – With Yellow 1 dc in each dc, join. 6th Row – *1 sc in next st, 2 sc in next st, repeat from * all around, join (72 sc), break Yellow. Attach White and work from the 7th through the 15th row, break thread. With Yellow, crochet the 2 sections together as follows: 1 sc in each stitch of petal to the 2 ch loop, ch 2, sc over the 2 ch loop of the 13th row picking up the same loop of under section, ch 2, sc over the 2 ch loop of 12th row picking up the loops of both sections, continue working an sc over each 2 ch loop with ch 2 between each sc down to the sc row of Yellow, ch 2, turn and work up to the top in the same manner, repeat from beginning all around, join. Next Row – 1 sc in each sc of petal decreasing 1 st in center of petal, ch 1, sl st between petals, ch 1, repeat from beginning all around, join, break thread. With Yellow cover a bone ring with sc and sew to potholder. Just an update on this pattern – I’ve been using the potholder now for a year or more, and I’m glad to say it’s holding up beautifully. I’ve taken big casseroles and pies out of the oven with an oven glove on one hand and using this potholder in the other. I’ve washed it a few times and it comes out of the laundry looking new. So far, very happy.